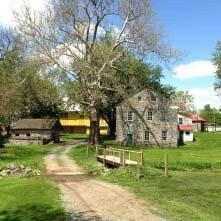 To step back in time, visit Historic Schaefferstown (HSI). The Pennsylvania German and Swiss cultures, which flourished here during the last few centuries, are authentically presented among several historic sites including Alexander Schaeffer Farm, a National Historic Landmark, the Thomas R. Brendle Museum, and the very unique Gemberling-Rex House. Sites are open for tours April 1st to October 4th. Please call to arrange tours at other times.